Michael Singer Studio, in collaboration with The Center for Discovery and supported by the Jeffrey Cook Charitable Trust, has created a new model for shared housing for individuals with Autism Spectrum Conditions (ASC). The design principles for this model embody a deep understanding of the complex physical, behavioral and social needs of individuals with ASC, and an appreciation for the ways the physical environment can be shaped to support and contribute to their overall well-being. Importantly, many of the design principles are congruent with sustainable design practices making the model more environmentally sustainable than traditional group home models. The Center for Discovery initiated the study since a large number of residents will be aging out of their programs for children, and some of these young adults can live independently with supervision and other supports. The need for housing for adults with ASC is also a national issue so the model has broad application. The shared living model is distinctive because it has several residents living together as the care providing family lives in a separate, but connected apartment. This housing arrangement allows for a higher quality of living compared to institutional or traditional group home settings, and fosters the formation of meaningful relationships between residents and the family. The shared living model is for four residents living in a ground floor apartment as part of a duplex home with a second floor apartment housing a couple, a young family, or two staff, who can provide individual and group care. A gradient of public and private spaces is a key design principle informing the layout of the duplex. This gradient of spaces enables and supports residents in regulating their level of social interaction. Hand in hand with regulating the intensity of social interactions is reducing the potential for sudden stimulus and behavioral triggers. Some of the strategies are physical design elements such as acoustical considerations, color selections, and lighting selections, while other strategies are spatial so as to have ample visual access to allow for previewing rooms, and multiple circulation alternatives. The model shared home is spatially organized around an indoor solarium offering the possibility for year round gardening, spending time in a vegetated calming environment and an abundance of natural light. The concept of flexibility pervades the overall design of the shared living model. While maintaining the essential design features for the residents, a variety of layout options are illustrated in response to different needs, scenarios and site conditions. The residential unit is entirely accessible in order to respond to the medical and mobility needs that many ASC individuals have or that may arise later in life. The model balances the spatial needs to provide accessibility with the benefits of compact layout, and balances the cost of construction so that financing is possible. The report contains a detailed matrix that elaborates the design considerations divided into four sections: areas, systems, materials and outside the home. Within each section the design parameters are detailed for specific spaces and elements that pertain to the needs of residents and to sustainable design. 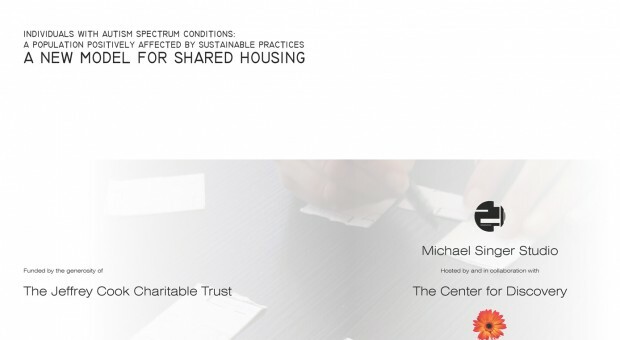 The project report A New Model for Shared Housing is available for viewing here.